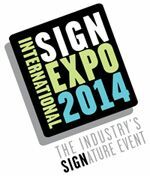 The ISA International Sign Expo 2014 is less than two months away and it’s shaping up to be an interesting event. More than 17,000 sign industry professionals and 500 exhibitors are expected in Orlando April 23-26, and there will be significant digital signage activity. If you have not been following the developments at the ISA, you’re missing a part of the digital signage market that offers perhaps the largest growth potential in the near term– the adoption of digital signage tools and solutions by traditional sign companies. This base of providers– that have been providing static, printed signs by the millions to customers for decades– have something that many digital signage equipment, software, and integration providers can struggle to find. Customers that is. If you’re in the pure digital signage arena, and you’re reading this, you may think you’ve looked about everywhere to find new customers, but I doubt you’ve really mined a significant portion of the huge number of static sign providers who are exploring, with their customers, the conversion to digital. The kind of folks who will be at the ISA show and are eager to partner with digital signage solution providers. The ISA Sign Expo website, http://www.signexpo.org/ has a lineup of all the events planned as well as a listing of participating exhibitors. To help our readers better understand the market crossover, I recently spoke with Glenn Feder, Director, Business Developmentat the International Sign Association. Joining ISA in 2013, Glenn is responsible for identifying opportunities for the Association to drive added value to all parts of its sign and visual communication industry constituents. Glenn also leads ISA's Dynamic Digital Signage initiative, focusing on educating and positioning sign companies as key players in the dynamic digital signage market. He also sits on the Digital Signage Experts Group Advisory Board. Keene: The ISA Expo (International Sign Association Expo) that takes each spring– the next one is April 23-26, in Orlando– what could the AV integration community learn by attending the expo? Glenn Feder: Our primary objective is to engage and educate U.S. sign companies about dynamic digital signage and how they are ideally positioned to deliver these solutions to their existing local, regional and national customer base. It's our feeling that the AV community can join the sign company community to bring dynamic digital signage solutions to end-users that are still looking for that trusted advisor to help them navigate what can be a complex and ever-changing landscape. Our event will feature focused education, the Dynamic Digital Park on our expo floor and other events for all those interested in this market to network, collaborate and partner, along the way to more clearly defining this market and identifying those in the best position to deliver long-term, successful Dynamic Digital Signage solutions to a large market sector that is growing exponentially. Keene: How could AV and Digital Signage equipment manufacturers benefit from exhibiting at or attending the ISA expo? Feder: Our sign company attendees have a keen interest in playing a dominant role in the digital signage sector, primarily in the local and regional market but also with national customers looking for large-scale deployments. They're hungry for information on what products and solutions can best fit their customers' needs and are looking for partners to help deliver these solutions. The Dynamic Digital Park area on the Expo floor (dedicated to Dynamic Digital exhibitors) which is seeing exceptional growth since its launch at our 2013 event, is a great place to engage with sign companies that own deep relationships with end-users nationwide, that are looking for Dynamic Digital Signage solutions. We are staging events and offering education designed to foster networking, information exchange and collaboration all in a buyer-seller-partnership setting that revolves around the Dynamic Digital Signage market. Keene: How do you see registration for the ISA show shaping up? Feder: We're expecting an increase in attendance this year compared to the last time we staged in Orlando with 17,000 expected to join us in April. Typically, 20 percent are international attendees and we expect that to hold for the 2014 event. We've added a number of new events for 2014 and built upon some of the most popular 2013 additions. In terms of what's new, we'll have an unprecedented number of co-locations on site. ALMO is bringing its E4 AV tour. We're continuing to deepen our partnership with the Society for Experiential Graphic Designers by introducing SEGD Design+Connections, a new one-day education event focusing on placemaking, branded environments, accessibility, technology and media, and other issues specific to design for the built environment. The format will couple lecture-style presentations with panel discussions and breakout trend sessions. Our educational events--which will occur on the trade show floor and in separate meeting spaces--all will focus on solutions to the problems that sign and visual communications industry professionals face each day. With more than 500 exhibitors expected, ISA International Sign Expo will be the best place to explore the breadth of the sign and visual communications industry. Keene: How would you describe the average attendee at the show? How is the attendee mix changing, as more and more digital technology is entering the signage industry? Feder: We have a wide range of attendees that come to the ISA Sign Expo looking to find new business partners and suppliers, take advantage of our education and network with new and old friends and colleagues alike. The largest national sign companies and distributors attend along with several thousand local/regional sign companies and planners. 49% of our attendees are either the owner/CEO or serve in a senior management position. When reviewing our total attendance 89% have purchasing power and 84% purchase either at the event or within 6 months of the staging of the Expo. There is an evolution occurring with many of our family-owned sign companies. Whether it's because a more technologically savvy generation is getting involved or that their mentors see the potential of the Dynamic Digital Signage sector, many of the sign companies are extremely excited about expanding their product/service portfolio to include these solutions for their customers. We also are in our second year of a highly successful hosted buyer program designed to bring more designers, architects and sign specifiers to the ISA Sign Expo. The projects they are working on are driving great interest in dynamic digital signage technology and solutions . We also see our sign companies bringing more of their customers (the end-users) to walk the trade show and in many cases, to focus on the digital solutions and products. Keene: Do you see, at the ISA show, more activity involving digital signage? (such as used for corporate communications, education, transportation, etc). Feder: Based on surveys and anecdotal discussions with our members and ISA Sign Expo attendees, dynamic digital signage will continue to be a high growth segment of our show floor and conference. After a highly successful inaugural year last year that resulted in a sold out Dynamic Digital Day conference and well represented Dynamic Digital Park on the expo floor, we are seeing substantial increases in participation and interest for 2014. Our attendees are pursuing the entirety of vertical markets that they have served over the years, leveraging the strong relationships they've built to move into providing dynamic digital signage solutions. Keene: How do you see that reflected in exhibitor mix, at the ISA Expo? Feder: We're seeing more and more interest and participation from digital signage suppliers, distributors and manufacturers and we expect this trend to continue. We are also seeing a strong trend in some of our key suppliers in the traditional sign market developing and releasing new product lines that are directly related to dynamic digital. We're also seeing sign companies putting together and exhibiting their own solutions based on what they're having success with in their particular markets that in turn, is driving others to discuss, embrace, innovate and invest in dynamic digital signage as a natural evolution of product/service offerings of the sign industry. Keene: The ISA show will feature the Dynamic Digital Day Conference Sessions. How is that structured? What is the goal of those specific conference sessions? Feder: After a highly successful debut in 2013, the ISA Sign Expo 2014 Dynamic Digital Day Conference is designed to offer attendees both introductory and more sophisticated content for those investigating the market for the first time and also those that are ready to take some next steps in delivering solutions to their customers. On the Wednesday preceding the show floor grand opening, we will have 8-10 sessions, each with 3 key learning objectives. Those sessions currently finalized with their associated learning objectives are below. And just as important as the content and structure of our sessions is our lineup of presenters. We're excited and honored to have session content experts from industry leaders like Saddle Ranch Productions, Allure Global Solutions, Bass Pro Shops, Multi-Media Solutions, Inc., N. Glantz & Son, MVIX and Brawn Consulting, among others. Keene: The ISA show is the focus in the spring, but does ISA have year-round activities that might benefit the AV and digital signage community? Feder: ISA as an organization has invested heavily in online learning this past year and will continue to offer Dynamic Digital Signage courses available throughout the year. Also, we are proud to announce a recent partnership with the Digital Signage Experts Group to provide Dynamic Digital Signage certification and training to our members and Expo attendees. Keene: What is the best way to learn more about the ISA, and the ISA expo? Keene: The AV community is very familiar with DSEG (Digital Signage Experts Group), run by Jonathan and Alan Brawn. ISA works with DSEG, can you explain why and how? Feder: ISA members and ISA Sign Expo attendees are able to take DSEG courses– that started Q1 of this year. We intend to run a promotion where the first 100 ISA members to take and complete a DSEG course by mid April will get 100% reimbursement of the fee. After that, our members will have the opportunity to take these courses at a discount off the retail price. Keene: What is the most interesting thing that technology providers might learn about ISA member companies, in 2014? Feder: I think they'll find that our sign companies are looking for new ways to embrace the dynamic digital signage market and that the path to the thousands of local and regional (and in some cases national) end-users goes through deep relationships already held by the sign companies. They'll find that sign companies are looking for technology and product partners that can help them identify and meet customers’ visual communications needs through digital signage solutions.